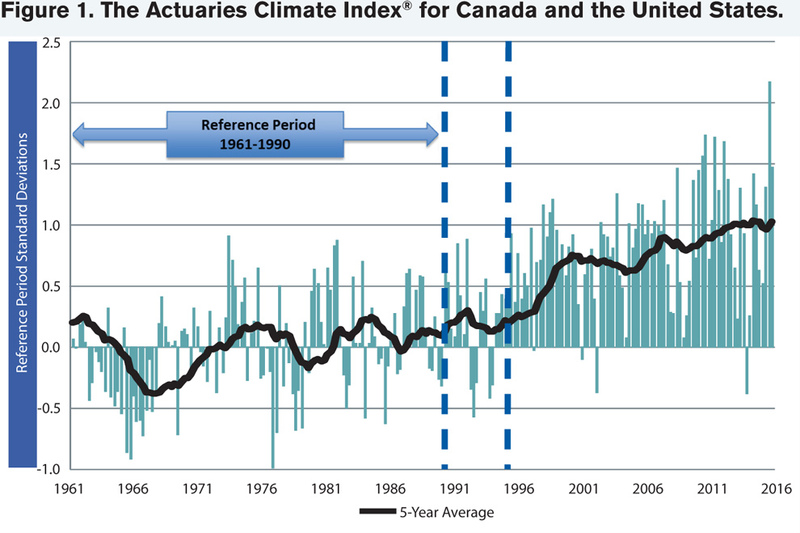 The American Academy of Actuaries, the Canadian Institute of Actuaries, the Casualty Actuarial Society and the Society of Actuaries created a working group to develop the Actuaries Climate Index® (ACI) and Actuaries Climate Risk Index™ (ACRI). This is a great example of how various actuarial organizations can work together for the betterment of society. The ACI objectively measures changes in certain climate-related variables. The ACI was first launched in November 2016 and is updated quarterly as data for each meteorological season become available. The intent of the ACI is to be objective and not address the causes of climate change. The ACI provides actuaries with historical climate data sets to assist in financial models that may correlate exposures with climate change. Temperature extremes, heavy rainfall and sea level increases are the main drivers of the increase in the climate index. ACI information and its underlying data are available publicly for others to use on the website actuariesclimateindex.org. How actuaries might use this information is essentially untapped; however, I’m excited about the impact this information, and the availability of it, can have in climate-based risk assessments. As Figure 1 displays, starting in 1991, the five-year moving average of the ACI displays a clear upward trend. Work is still in progress on the ACRI, the second index that will relate the historical correlations of economic losses, deaths and injuries to the ACI data. The Institute and Faculty of Actuaries (IFoA) was engaged to peer review the ACRI. ACRI could be a tool to help actuaries evaluate the risk of climate change for specific regions and lines of business. The ACRI is sure to have a number of uses, and I am excited to see the various applications. According to the World Economic Forum (WEF), extreme weather, natural catastrophes and the climate change that may affect them are among the most prominent risks to the global economy. Figure 2 displays the top five global economic risks in terms of likelihood and impact, as identified by the WEF. Source: “Global Risks Report 2017,” World Economic Forum. For each variable, the value in a particular period is compared to the average value for a reference period; the difference between these values is standardized using the observed variability for the reference period. The ACI represents the average of these standardized anomalies across the six key variables. Because of this procedure, the ACI measures extremes in the variables it observes, not their absolute change in one direction or another. 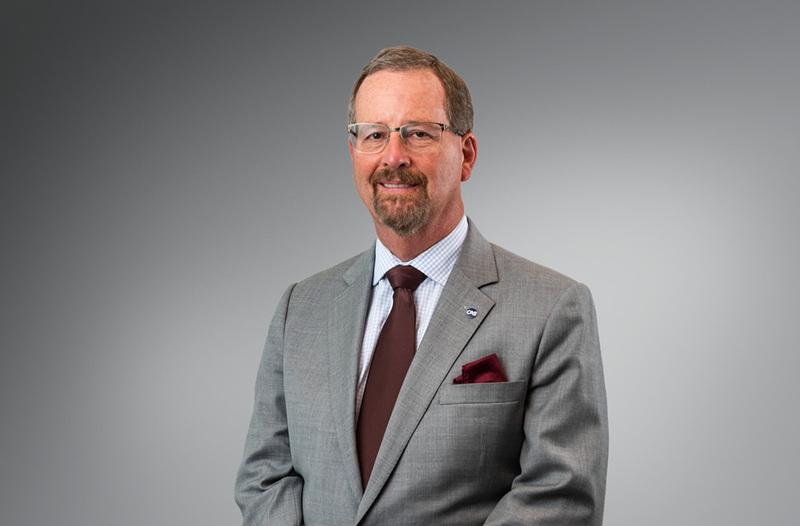 Because of the importance of these risks and their potential impact on the insurance industry, climate change may be one of the most relevant themes facing the actuarial profession in the coming years. Actuaries must be able to assess, quantify and forecast risks associated with climate change, and understand how a changing climate influences property, casualty and economic exposures. Climate change can certainly have a significant financial impact on not only the insurance industry, but also the general population. It appears that flood events in the U.S. are increasing in frequency and severity. Some of this may be due to climate change and some due to population density in flood-prone areas. The National Flood Insurance Program (NFIP), backed by the U.S. Treasury, writes the majority of personal lines flood policies. 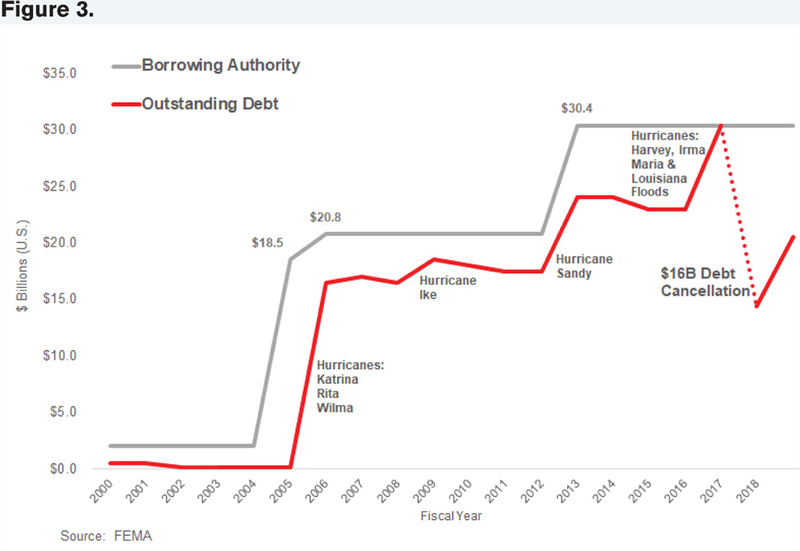 Starting with Hurricane Katrina in 2005, the NFIP began to incur significant debt as losses far exceeded premium. See Figure 3. 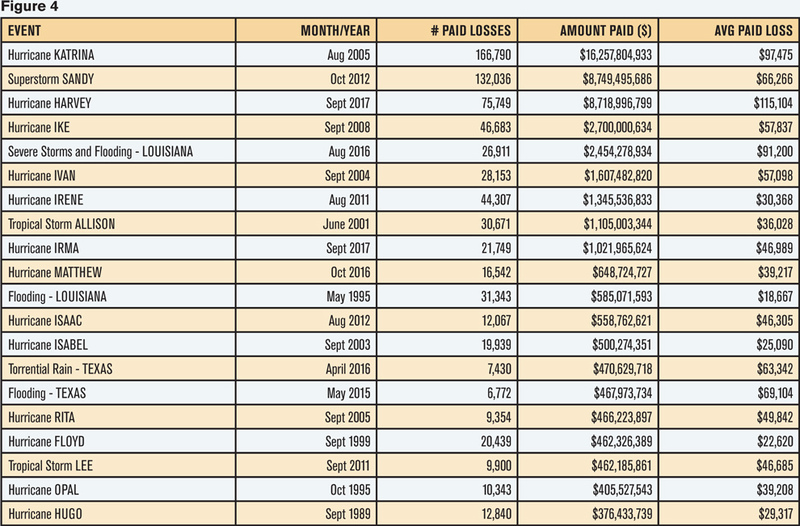 Data shown in Figure 4 indicates that 13 of the 20 largest floods since 1989, or 65 percent (in terms of losses paid by the NFIP), have occurred since 2005. As noted previously, the ACI has trended upward over this same time period. Hurricanes Florence and Michael are major recent events, but complete paid loss data is not yet available to include in the table. Source: “Significant Flood Events,” FEMA. While much of the flooding associated with these events occurred outside designated floodplains, such as NFIP’s Special Flood Hazard Areas (SFHAs), a major public policy issue is that most homeowners who are not in these high-risk areas do not have flood insurance. It is estimated that only two of 10 homeowners in Hurricane Harvey’s affected areas had U.S. federal flood insurance and less than one in 10 homeowners in Hurricane Florence’s affected areas had U.S. federal flood insurance. The low uptake of NFIP insurance, combined with a rate structure that does not sufficiently match price to risk, results in adverse selection that leads to the worst of all worlds — large numbers of citizens underinsured for flood, delayed economic recovery for families and communities and an NFIP that increasingly must rely on U.S. taxpayers to fund frequent floods. Recent legislation. The U.S. federal government has designed, and one house of Congress has passed, a package of component reforms that analysts agree would reduce the NFIP’s exposure and promote the growth of private flood insurance. The NFIP itself has implemented a few of these ideas within its administrative authority. Reinsurance and insurance market capacity. Reinsurers, in a historically favorable environment for raising capital, are aggressively seeking to diversify their disaster exposure while tapping new sources of premium. Insurers are increasingly savvy in designing and marketing programs to apply this reinsurance capital and obtain new flood insurance customers. Consumer demand. Recent events, and the attention of a more ubiquitous media, have steadily improved awareness of the advantages of flood insurance and perhaps affected individual tolerance for disaster risk. Flood risk models and technology. Actuaries, catastrophe modeling firms and reinsurers have made significant strides in modeling flood risk. Their investments have produced tools that offer the capability of highly granular, point-of-sale flood risk assessment and pricing, and insurance programs acceptable to regulators that incorporate the precise and on-demand pricing into underwriting workflow. Relative elevation (to surrounding area within a radius). The actuarial profession has contributed to awareness of flood insurance issues through activities such as the American Academy of Actuaries 2017 monograph, The National Flood Insurance Program: Challenges and Solutions. More recently, the Academy’s Extreme Events Committee sent a letter to state insurance regulators outlining key issues for consideration as regulators evaluate private flood insurance proposals in their states. 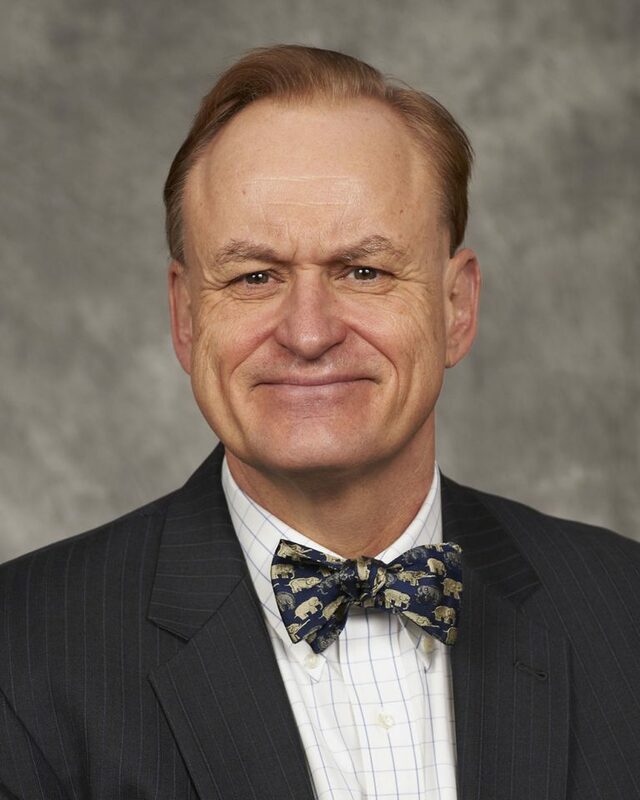 The CAS has hosted webinars in the past few months offering efficient training on flood insurance issues and pricing methodology. Ultimately, the energy and expertise of future actuaries will determine the advancement of tools to better price risks and relate climate change to the hazards that directly affect insured exposures. This will help individuals and communities protect against flood and other types of losses, while ensuring that the insurance companies they rely on can remain financially sound. I am pleased that the ACI, ACRI and actuariesclimateindex.org are generating enormous interest. Since the initial launch in November 2016, there have been more than 35,000 visits to the website with data being downloaded over 2,700 times. I am glad that we have so many good minds researching this information. As more actuaries are aware of the availability of this data, I am certain that it will continue to be used to better price risks related to climate change. As with the use of any data or information, please understand the underlying data and limitations and review the methodological disclosures in the ACI documentation.